Switching provider may not help if they are using the same server when routing to the EA servers. Try contacting the server owner directly with the trace routes online. I do not have the packet loss at hop 8, maybe due to my physical routing. The only settings I have changed on my hub that could have any possible effect is my MTU is set to 1472 and Block Fragmented IP Packets is ticked. Can you confirm if this is a business or residential account? Residential. Why, what's the difference? Plus looking at the traceroutes I've posted the lag is occurring when it reaches zayo.com. This seems to me like like a routing issue. 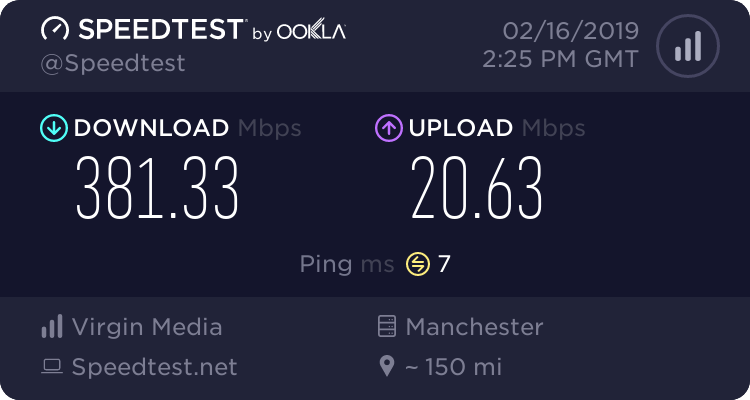 Can my data be routed differently or not? If your experiencing constant lag in online games and virgin have told you everything is fine with your connection, then obviously virgins network is bad for gaming regardless what people tell you on here. I would advise you to switch to either sky or BT if your an avid gamer. In tests conducted besides speed virgin are the worst for packet loss and jitter which is exactly what your issue probably is. For online gaming, virgin media are best to be avoided, you will get a far better experience with sky or bt and even plusnet. These 3 were ranked better than virgin.